One of four people charged with a role in the death of Cassandra Harris, 24, had his sentence deferred for three years based on the condition that he testify in matters related to the case. Nineteen-year-old Donovan Anthony Sherwood’s guilty plea was part of an agreement that calls for his sentencing to be deferred on the condition that he testify that Harris was pushed from a moving pick-up by Joseph Parizeau Jr., 22, of Big Arm and that Parizeau threatened the others involved if they told anyone what happened. 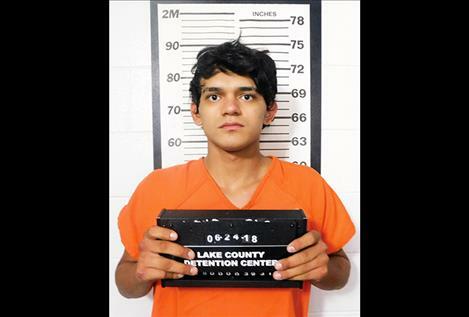 An intense investigation by the Lake County Sheriff’s Office, Montana Highway Patrol and Flathead Tribal Police lead to the arrests of Sherwood, Parizeau, Gale Hendrickx, 19, of Pablo and Julia Vaile, 18, of Browning. Sherwood entered a plea of guilty to obstructing justice during the change of plea hearing on Oct. 11, admitting that he lied to authorities who were investigating the death. The charge carries a maximum of ten years in prison. A group of hikers found a severely injured Harris face down on McDonald Lake Road the morning of June 23. She died of her injuries days later. It was an emotional day at District Court in Polson on Nov. 29 as Harris’ sister, Michelle Sharbono, took the witness stand during sentencing and requested that Judge Kim Christopher reject the plea agreement. She said if the plea agreement is accepted, Sherwood should get the whole ten years available to the judge if he “messes up” during the deferment period. A tearful Pamela Clary, Harris’ mother, also took the stand. She did not agree with the plea agreement and said Sherwood “has not owned up to his role” in the death of the daughter. “If it was an accident why did you leave?” she asked Sherwood. Clary suggested that Sherwood should donate either time or money to a local charity as part of his punishment. In the end, the judge went along with the plea agreement explaining that Sherwood is an important witness to the state in testifying against the others and apologized to Cassandra Harris’ family. Christopher added a condition to the agreement that Sherwood needs to write a report about the organ donor program recognizing that Harris contributed five organs to it. Sherwood was also ordered to give a presentation twice a year to the Boys and Girl’s Club about what he has learned from this experience after all the other cases are resolved. Vaile is facing charges for leaving the scene of an accident, while the charges against Hendrickx were dismissed.